An extraordinary portrait of an artist and amateur naturalist who explored the teeming life of the Amazon and helped lay the groundwork for our present-day understanding of ecology. 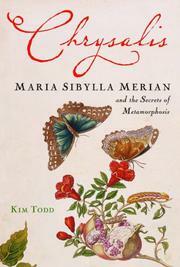 Daughter of a prominent Frankfurt publisher of illustrated books, Maria Sibylla Merian (1647–1717) mastered the art of drawing and engraving while studying the metamorphosis of silkworms. She went on to paint the larvae of butterflies and moths and to raise important questions about the role of intermediate life forms. With a detective’s eye, PEN/Jerard Fund Award–winner Todd (Tinkering with Eden, 2001) has pieced together the life of this neglected genius who charted the micro-world of insects. While male contemporaries considered a species in isolation, Merian looked at its relationship to the environment, its sensitivity to change and its long-term survival strategies. Todd gives equal time to Merian’s own metamorphosis. The artist abandoned her husband and took up residence in an austere Pietist community in the Netherlands. She sold her paintings to support her mother and her daughters. She befriended naturalists, scientists and collectors in Amsterdam during its Golden Age, produced a popular book on caterpillars and at age 52 set off for the Amazon to document new species and collect snakes, iguanas and geckos for resale back home. Merian sold everything to finance her journey, braving tarantulas and yellow fever to produce a landmark work. After her death, Peter the Great purchased her paintings and field notes, which later languished in vaults until long after the Russian revolution. European publishers pirated her prints and displayed them out of order, misrepresenting her main ideas. Todd’s long overdue re-examination of Merian’s work shows the extent of her scientific contributions and reminds us how much of our early understanding of biology depended on the keen eye of the amateur. This bold, wide-ranging text also considers the theological view of metamorphosis, the controversy over spontaneous generation, Merian’s connection to other accomplished women of her day, her opposition to slavery in Surinam and her reliance on Amerindians to bring her specimens. A breathtaking example of scholarship and storytelling, enriched by ample illustrations of Merian’s work.